Our sand facility is available for your event needs. We have four 16″ deep full-size sand courts and plenty of area off the sand to accommodate your event. Tables and/or seating available as needed. We have public beach-style showers to rinse off the sand and cool off when you need. You may cater your own event or we can offer some catering options at an additional cost. Our facility is open year-round and our courts are indoor where the elements cannot interrupt your event! Events hosted here include birthday and graduation parties, end-of-school and end-of-season celebrations, pre-wedding parties, corporate and team bonding adventures as well as church outings. What event can we help you with? Our basic event size starts at 10-12 participants using just one court for two hours. We scale up from there, depending on the number of participants you are planning for. You can rent one court or the entire facility. You can rent for two hours or all day! Best options for rental tend to be weekends. We also have available court time Monday through Friday 8am – 5pm. 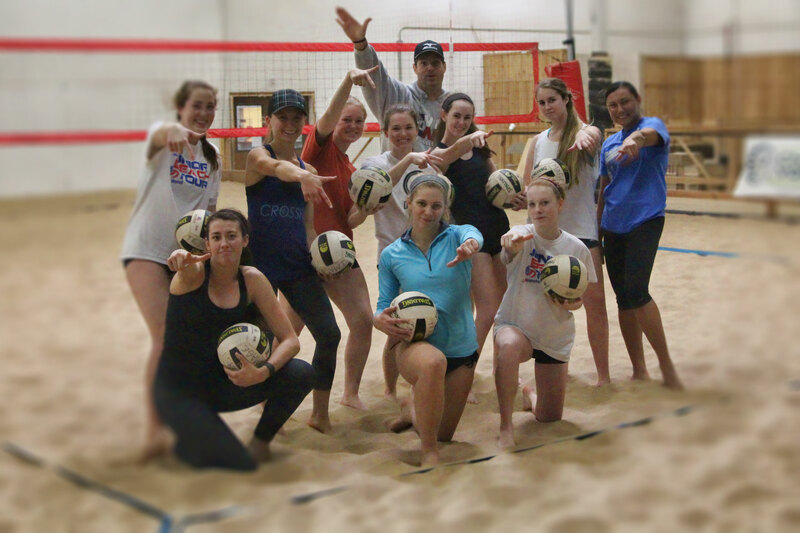 Monday through Thursday nights are busy with junior beach volleyball year-round. Please contact us for availability at the email or phone number below or via the form at the right. Rates start at $125 which includes use of one court for two hours. Rates get better as you had courts and/or time to your event. Contact us for details and a quote.